⟹ Traditional Thinking: Production is driven by a sales forecast (Push system). ⟹ Lean Thinking: Production is driven by customer demand; items are only produced when an order is placed (Pull system). ⟹ Traditional Thinking: Problems are viewed as just that, problems. ⟹ Lean Thinking: Problems are viewed as opportunities for improvement often through root cause analysis. ⟹ Traditional Thinking: Work in process (WIP) is viewed as a normal part of operations. ⟹ Lean Thinking: WIP is a sign that a process needs to improve and is considered a type of waste that should be reduced or eliminated (the same is true for inventory). 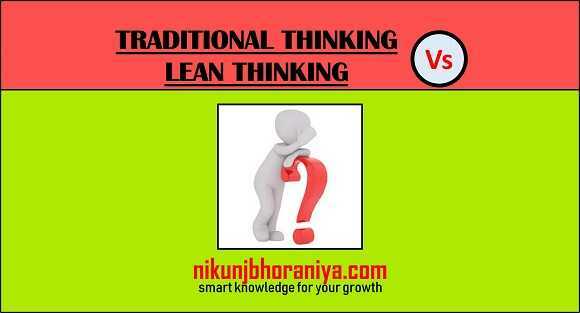 ⟹ Traditional Thinking: Improve system (disregarding all of the types of waste in the process). ⟹ Lean Thinking: Improve system by 1) Eliminating waste and 2) Improving current processes. ⟹ Traditional Thinking: Management is the primary driver of change. ⟹ Lean Thinking: Everyone is empowered, trained in the principles of lean and encouraged to look for ways to improve processes. ⟹ Traditional Thinking: If a process is working don't fix it. 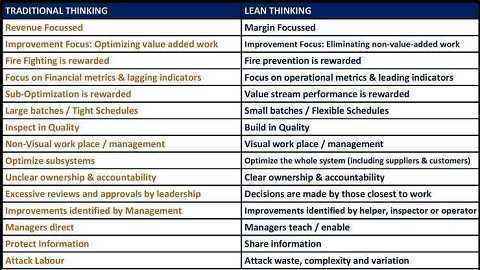 ⟹ Lean Thinking: Always look for ways to improve processes. ⟹ Traditional Thinking: Standardized work (people performing the same task in the same way) only exists in documents like SOPs, rarely in reality. ⟹ Lean Thinking: Everyone performs the same task the exact same way until a better way is discovered; then everyone performs the task of the new and improved way. ⟹ Traditional Thinking: Focuses on training and relies on people to not make mistakes. ⟹ Lean Thinking: Focuses on building processes that are error proofed (so that a person cannot make a mistake or it would be difficult to do so). ⟹ Traditional Thinking: Systems thinking (views the organization as a whole), often ignoring or unable to see the enormous opportunities for improvement.